With around 9,000 extant species, birds are the most species-rich group of land vertebrates. As seed dispersers, flower pollinators, predators, prey, and through numerous other interactions they play an important ecological role in today's world. Although a picture of past ecosystems is thus likely to be quite incomplete without consideration of their avifaunas, Cenozoic fossil birds are still significantly underrepresented in even the most recent treatises of vertebrate paleontology. This is particularly true for Paleogene taxa, whose diversity has just begun to be appreciated. The Paleogene covers the first half of the Cenozoic, from the mass-extinction events at the end of the Mesozoic era, 65 million years ago (Ma), to the beginning of the Miocene, 24 Ma. It has long been recognized that this geological period was pivotal for the early diversification of modern mammals and birds. Whereas, however, the mammalian Paleogene fossil record is intensely studied and set into a paleobiogeographic and paleoecological context (Rose 2006), no comprehensive surveys exist for that of birds. 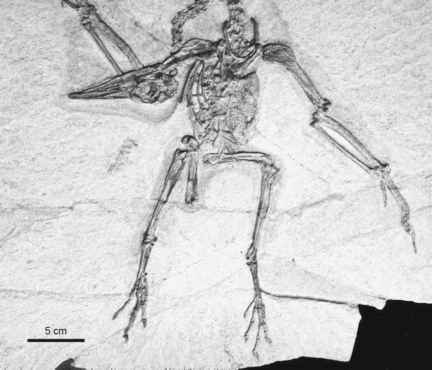 Until a few decades ago, our knowledge of the early evolution of modern birds was indeed very patchy and mainly based on fragmentary bones of often uncertain phylogenetic affinities. As will be evident from the present work, this situation has dramatically changed. At least in the Northern Hemisphere, the Paleogene fossil record of birds is no longer much short of the mammalian one concerning the number of well-represented higher-level taxa. In some renowned fossil localities, such as the London Clay in England and the Green River Formation in North America, remains of birds are even much more abundant than mammalian remains. Numerous Paleogene avian taxa were described after the publication of Olson's (1985) comprehensive and often-cited survey of the fossil record of birds, and most of these are also not covered in the more recent book of Feduccia (1999). These fossils not only afford information on major morphological transformations which occurred in the evolutionary lineages of the extant avian taxa, but also provide otherwise unknown data on the historical biogeography of the latter. Many further belong to remarkable extinct groups without modern counterparts, and allow intriguing insights into the past diversity of long-vanished avifaunas. In the present book the Paleogene fossil record of birds is detailed for the first time on a worldwide scale. I have developed the idea for such a project for several years, and think that it is an appropriate moment to present a summary of our current knowledge of the early evolution of modern birds. Meanwhile not only is there a confusing diversity of fossil taxa, but also significant progress has been made concerning an understanding of the higher-level phylogeny of extant birds. Hypotheses which were not considered even a decade ago are now well supported by independent analyses of different data. In several cases these group together morphologically very different avian groups and allow a better understanding of the mosaic character distribution found in Paleogene fossil birds. The book aims at bringing some of this information together, and many of the following data are based on first-hand examination of fossil specimens. In the first chapter, the most important fossil localities for Paleogene birds are introduced. I then outline current hypotheses on the higher-level phylogeny of birds and summarize the Mesozoic fossil record of Neornithes. Discussion of the Paleogene fossil record forms the main body of the book and is distributed over 12 chapters, in which the reader finds data on basic morphological features of the various taxa and their temporal and geographic distribution. As far as this is possible, the fossils are placed into a phylogenetic context in the light of current hypotheses on the interrelationships of extant birds. General aspects of their paleobiogeo-graphic and paleoecological significance are summarized in a concluding chapter. Although I tried to be exhaustive, I did not intend to write a catalogue and some fragmentary remains of uncertain affinities are not accounted for (for comprehensive lists, see Lambrecht 1933; Brodkorb 1963, 1964, 1967, 1971, 1978; Bochenski 1997; Mlikovsky 1996a, 2002). Fossil remains other than bones (e.g., trackways, feathers, and eggs) are also only occasionally mentioned, as these often cannot be assigned to particular taxa with confidence. I further largely ignored the poorly founded synonymizations made by Mlikovsky (2002) (see Mourer-Chauvire 2004 for a critical review). Throughout the text, English equivalents of the Latin standard nomenclature of avian anatomical features (Baumel and Witmer 1993) are used. Author names are only given for fossil species at first mention, unless the describer of a taxon is not obvious from the context. Extinct taxa are indicated by a dagger in the headings of the sections. The terms "crown group" and "stem group" specify the position of fossil taxa with respect to their extant relatives. As used in the following, the crown group of a certain taxon is the clade including the stem species of the extant representatives of this taxon and all its extant and extinct descendants. Stem group representatives are all taxa outside the crown group. Whereas stem group representatives are always extinct, not all crown group representatives need to be extant taxa. Unspecified clade names refer to the total group, i.e., the clade including stem and crown group representatives, which in some instances is denoted with the prefix "Pan-." The term "Neornithes" is used for crown group Aves. "early Oligocene" (Chadronian land mammal age) are now considered to be from the late Eocene, and those from "middle" or "late" Oligocene deposits (Orellan and Whitneyan land mammal ages) are of early Oligocene age. Whereas the mammalian fossil record has already been adjusted to these new calibrations, the incorrect earlier stratigraphic ages continue to be used in most recent paleornithological accounts (e.g., Feduccia 1999; Caley 2007; and several of my own publications). Because these changes are incorporated in the present book, the ages of some North American taxa depart from those in earlier publications. The same applies to the stratigraphy of the Oligocene of South America, where the Deseadan land mammal age is now regarded to be from the late Oligocene, not the early Oligocene as assumed by earlier authors (see also Sect. 2.4).